Chile’s Atacama Desert is one of the best places to observe the skies on Earth. As a result, astronomers gather there hoping to find answers to life’s fundamental questions. Meanwhile, archaeologists work nearby piecing together clues to Chile’s ancient history. The country seems happy to examine its past in these two areas. However, it is not able (or perhaps, in some cases, willing) to look into its more recent past - concerning the devastating regime of Augusto Pinochet. Nostalgia For The Light starts with wonderful scenes of the observatories in Chile and the stunning images of the cosmos that they have captured. Next, the film looks at the fascinating artifacts, paintings and rock carvings - each thousands of years old - that have been discovered by Chilean archaeologists. Director Patricio Guzmán, questions the concept of time and discovers that there is no such thing as the present - everything is in past. He then asks an astronomer and an astrologer why Chile cannot focus on events in the country's more recent past. This proves an impossible question to answer. It is also a truly heartbreaking one as Nostalgia For The Light looks at the story behind Chile’s 'disappeared'. The Rettig Report, designed to investigate the disappearances and human rights abuses that occurred in Chile during the Pinochet years, found that 2,279 persons who disappeared were killed for political reasons. In addition, 30,000 people are believed to have been tortured and a further 30,000 could be added to this number as many may not have wanted to come forward. The film charts the plight of the families of the disappeared - many of whom still do not know what has happened to their family members. After the discovery of human remains in the Atacama desert (including mass graves), groups of women started to comb the barren landscape (described as the closest thing we have to Mars on Earth) looking for the bones of their loved ones. Guzmán talks to several of these women and it is truly heartbreaking to hear their stories. All they want is to retrieve the remains of their relatives so that they can give them a proper burial. It seems clear that, given the size of the desert (and the rumours that many bodies and body parts were thrown into the sea) that their search will be in vain. You feel their pain and it is almost unbearable. Guzmán also talks to the daughter of disappeared parents. Brought up by her grandparents, she has struggled with the huge gaping hole in her life. She has moved on, married and now has a son of her own. She takes solace in the fact that her husband and son will never know the pain that she has experienced. She also finds comfort in astronomy and the fact that, on a molecular level, we are all a part of the past and, as a result, nothing is ever truly lost and nothing ever dies. Director, Guzmán, has been living in exile from his home country for over 30 years. 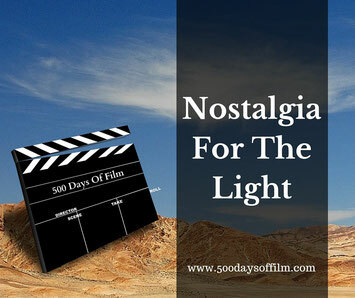 Have you seen Nostalgia For The Light? If so, I would love to know your thoughts. Why not leave a comment in the section below? I’d love to talk movies with you.